A LOYALIST-SIDE mediator has appealed to the Sinn Fein lord mayor of Belfast to open dialogue over a troubled interface in the east of the city. Johnnie Jackson said something must be done to ease tensions at loyalist Cluan Place, where residents have reported regular sectarian attacks in which missiles are thrown over a peace wall from the nationalist side. Referring to the incidents, which have seen golf balls, snooker balls, industrial metal bolts and petrol bombs thrown over the divide, he said it is time communication channels between both sides were rebuilt. “Tensions have been rising progressively over the last two or three years and no one seems to want to do anything about it to resolve the tensions and move forward,” he said. Mr Jackson said this needs to be brought to the attention of Belfast lord mayor Niall O’Donnghaile – who lives in nearby Short Strand – before the situation “spirals out of control”. “What’s going to happen if this issue isn’t addressed is a child is going to be hit on the head by one of these missiles and killed, and someone will retaliate – be that the paramilitaries or even just a family member,” he said. He said he wants to have a sit-down with Mr O’Donnghaile to consider ways to ease tensions. “I have contacted the lord mayor and the ball is in Sinn Fein’s court,” he said. Mr Jackson said he believes Sinn Fein is unaware of how serious the situation at the interface actually is. “I would give them the benefit of the doubt,” he said. “It’s not that they are turning a blind eye to the violence, they probably don’t know how bad it is. Mr O’Donnghaile acknowledged that there is trouble at “several interfaces” across the city, however he said the issue was an anti-social one as opposed to sectarian. He said: “In the main, these sporadic attacks are being carried out by anti-social elements within both communities. 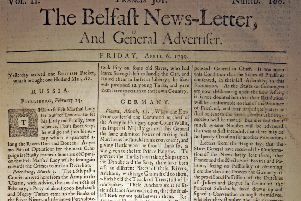 Mr O’Donnghaile would not confirm, however, whether he has received an invitation from Mr Jackson to meet or whether he would take him up on the offer. He added that residents should not “make the mistake” of comparing incidents at Cluan Place with rioting that took place at Short Strand last month in which gunshots were fired and a press photographer hit. “It was violent and it was sustained,” he said. While not comparing the last eight months of attacks on Cluan Place to the violence at Short Strand in June, Cluan Place community worker Maggie Hutton said residents’ reports need to be taken seriously. “If one of those metal bolts were to hit a child, we could be talking attempted murder,” she explained. While Mr Jackson is keen to open dialogue with the nationalist side, Ms Hutton said talks will have to be carried out by mediators because residents “are not ready” for communication.